Twice-monthly email with invites to events in your region*. Access to the concerts calendar. Privacy - your info is not shared outside our network. (soon) - your fan profile - track your events, review concerts, support your favorite venues and artists! for all others your whole country is your region. 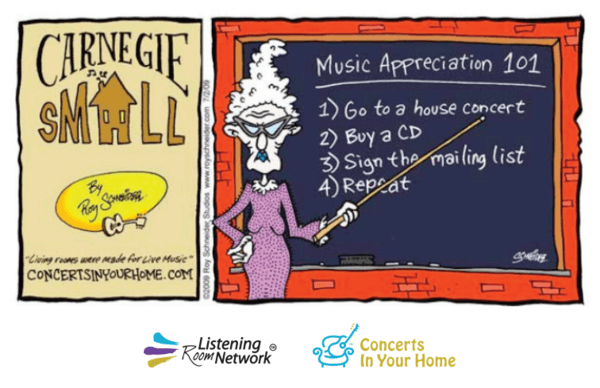 Get invited to house concerts and special events in your area. Review and rate the shows you attend, make new friends, and help us build a stronger music community in your area. Full bands (with drum sets or 4+ members) have limited opportunities in our network. Videos that show you as a small act will improve your chances of a worthwhile membership with us. Please demonstrate something we can picture in most living rooms. Instrumental acts also have a difficult time booking house concerts through our network. Video must be fantastic and include great stage patter, humor, and connection with the audience. We only offer membership to acts we find likely to succeed. © Copyright 2006-2019. All Rights Reserved. Photos by Donna Green unless noted.